The Return of Old Style? Every beer lover over a certain age has one iconic brand etched into their youthful memories. For some in New England, it’s Narragansett, Rainier in the Pacific Northwest, or Grain Belt in the upper Midwest. For me, the brand was Old Style. Look at old family photos from the 1970s and deep in the background (if not in someone’s hand), you’ll see cans of Heileman’s Old Style beer. With its distinctive red, white, and blue label, its gothic lettered shield and red badge, the Old Style brand was omnipresent at family gatherings, available en masse in the fridge, and in our hands at Wrigley for Cubs games. The exteriors of Chicago bars were littered with Old Style signs, often with nothing more written on them than ‘cold beer’ in a half-dozen languages, usually Polish (‘zimne piwo’). Although I don’t recall it, I’d venture to say that my first sip of beer was probably Old Style. That last part probably explains why I didn’t start drinking beer until college. For all the nostalgia I feel for the brand–and it is a considerable amount–it’s really not pleasant to drink. Not even at Wrigley on a hot summer day when the Cubs are kicking the Cardinals’ or Brewers’ asses. Well, maybe then, but never elsewhere. So it is with some interest and trepidation that I received the news that Old Style’s owner, Pabst Brewing, has decided to renew its focus on the brand. 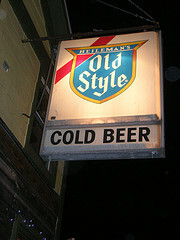 First brewed in La Crosse, Wisconsin in 1902 by Gottlieb Heileman, Old Style fell victim to the crushing beer wars and was eventually sold to the Stroh’s Brewery before its purchase by Pabst in 1999. Pabst recently announced that it would return to krausening Old Style for the traditional thirty day period at the City Brewing Company in La Crosse (home of the original Heileman’s brewery and previous home to Old Style). The Old Style’s brewers hope that krausening will “provide more body, flavor and a cleaner finish to Old Style – things we believe our loyal drinkers and our new beer drinkers will both appreciate and enjoy.” Beyond this new brewing step, Pabst plans to fashion a new advertising campaign to herald this relic/throwback brand and market it to the usual 25-29 year-old “tweener” market. Back around 1976, A-B (bottlers) were on strike. Schlitz had ruined the formulation of their beer and refused to acknowledge falling sales as a result. And then there was Old Style, gathering dust on local shelves since 1902. The local OS distributors went to every neighborhood tavern in Chicagoland and fought for beer supremacy…bottle by bottle, case by case, tavern by tavern and won. It was beer karma for OS. During the early 1980s, the brand controlled over 40% of the beer market here while the feds stopped G. Heileman from purchasing the faltering Schlitz. It was the right beer for the right time, and S & P Corp. will now do what they do best — not throw any money at the beer and just hope that word of mouth will do the rest. Out-of-towners will come to Wrigley Field, watch the Cubs lose while they drink Old Style, kraeusened or not, order a “Chicago-style” hot dog, and when they head out to one of the local bars, go back to their regular brand. Is the kraeusened Old Style brewed in La Crosse? I know that early on in it’s mode as “virtual brewery”, Pabst did some contracting with City, but I thought that mostly ended. Seems to me City, in both La Crosse and Latrobe, needs to get some contracts- according to newspaper reports, BBC ended their contract with Latrobe (now that they opened their eastern PA brewery, built by Schaefer) even after making big announcements about helping City to upgrade that brewery to make the Samuel Adams beers a year or two before. I assumed the change to the brewery was made to allow for some Coors products to be brewed there now- and Pabst is just taking advantages of the changes?